Can we leave the social problems to algorithm? Which kind of tech startups can value the most in the shortest time? Which kind of tech companies can take a share of the profits in the fiercely-competitive Chinese internet market? If you take reaching a valuation of about $30 billion in three years as an outstanding performance, then you should definitely look at Pinduoduo, a Chinese startup offering an online shopping platform. This three-year-old company raised about $1.6 billion in a US IPO two months ago, reaching a valuation of about $30 billion on its first day of trading. Though not comparable to Pinduoduo, the feed reader Toutiao and video-sharing application Kuaishou, which were both launched after 2010 but reached a valuation of billions of dollars, are also worth being noticed. What do these successful companies share in common? The most prominent factor must be the composition of their users – most of them are netizens who are less-educated and live outside China’s first-tier cities of Beijing, Shanghai, Guangzhou, and Shenzhen. Only 11.6% of Toutiao’s users are from the first-tier cities and this is already the highest ratio compared with Pinduoduo (7.6%) and Kuaishou (7.5%). 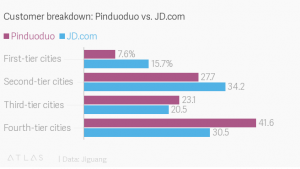 While JD and Alibaba, China’s largest e-commerce company, have steadily offered more and more luxury products on their site, Pinduoduo has moved in the opposite direction. 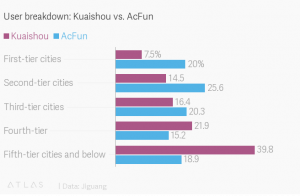 So is Kuaishou compared to AcFun, a cartoon-centric video site that has a bigger presence in China’s wealthiest cities. The emergence and surprising growth of these tech companies brings, what Jack Qiu would say, working-class netizens or information have-less to the stage. Information have-less refers to low-end ICTs (information and communication technologies) users, service providers, and laborers who are manufacturing these electronics. It is the diffusion and appropriation of working-class ICTs that have given rise to this new social category, and their existence is indispensable to China’s economic boom and its rise as a global IT power. Can algorithm solve social problems? 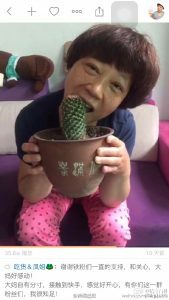 Though this article is critiqued for its labeling or even demonizing rural China by only displaying those startling and cruel videos, a stereotype towards Kuaishou and the rural China Kuaishou represents is inevitably formed. And this stereotype greatly affects how people view Kuaishou and its users. Even if Suhua tried to defend Kuaishou against this prejudice for quite a long time, the results hasn’t met his expectations yet. In a study from Peking University, the scholar states that not only has the duality of urban and rural culture, under the influence of the mass media, not eliminated but has become increasingly distinct. Mass media, based on middle class perspectives, has shaped the culture and identity of the city, and offered no space for rural communities to speak for themselves. All the discourses in mass media is a kind of imagination of rural China from the perspectives of urban citizens. Thus, some simple and crude imagination of rural China has been gradually stabilized and institutionalized in people’s minds. Morozov just found that not only is Zuckerberg’s opinion not feasible but also not desirable. Because “issues that give rise to publics need to be backed by reason giving, not by some invisible ultimatum-eventually encoded in algorithm-from above.” Even if people are willing to approach Internet companies and use these services, it is still should be fully aware of that there is a “tacit acknowledgement that deliberation and morality no longer command any respect in our political life” under this situation. 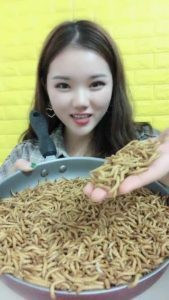 After being severely critiqued by national media for indulging teenager bloggers for publishing videos competing to be the youngest parents, Kuaishou was ordered to rectify by the Nation Radio and Television Administration. So when it comes to the case of Kuaishou, Morozov’s opinion seems to miss one prerequisite-that is users should have the ability to understand and analyse their situations before they can take the initiatives. Qiu, Jack Linchuan. Working-class network society: Communication technology and the information have-less in urban China. MIT press, 2009. 刘星铄, and 吴靖. “从 “快手” 短视频社交软件中分析城乡文化认同.” 现代信息科技 1.3 (2017): 111-113. Morozov, Evgeny. To save everything, click here: The folly of technological solutionism. Public Affairs, 2013. « There is Power in a Union! Leave the consumer out of it!